Nearly non-stop snowfall throughout January has made it difficult for crews to clear out plowed snow fast enough. After weeks of heavy snowfall, sunshine is finally back in the forecast for Summit County, providing a brief respite for snow removal crews that have been working double-time to clear roads getting as many as 50 inches a week. It’s meant a lot of overtime, snow hauling, and in the case of Frisco, a lot of towed vehicles. While plowing routes have largely stayed the same, the heavy build-ups have required more man-hours for pushing up snow banks and hauling away snow to make room for the next storm. In addition, the near-constant flurries throughout January have left crews struggling to move snow piles to storage lots fast enough. 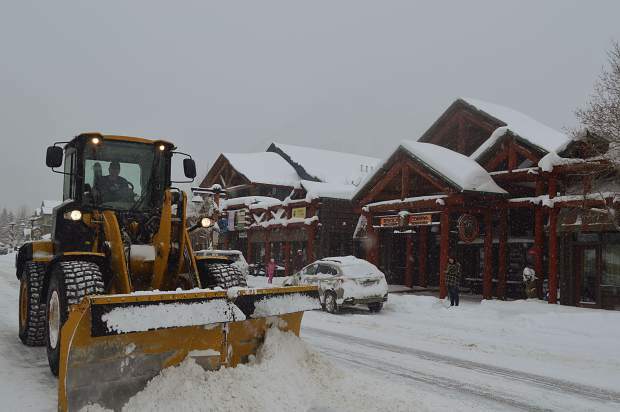 “It’s not necessarily the biggest snowfall year we’ve gotten, but the sheer volume in such a short period of time makes it very difficult for our crews to get it out of the way and into the storage piles,” said Breckenridge spokeswoman Kim Dykstra. In December, the town set a record with nearly 2,500 snow hauls, compared to last season’s 1,029 in the same month. January has already beaten that mark as well, and is on pace to be another banner month. Even with a 25-person crew working overtime, the town has had to call in as many as 29 outside contractors to help haul away the snow. “There was no one else to call to help us move it,” Dykstra said. Gosiorowski said he approved nearly 100 hours of overtime in the past two weeks for his 19-person crew, responsible for clearing around 160 miles of county roads and highways. Along with fuel, those time-and-a-half wages are the biggest added expenses when heavy storms roll in. And if the heavy snowfall continues throughout the winter, an extra cash infusion might be needed to keep up. In Frisco, the frenzied plowing activity has forced the town to tow cars left overnight on Main Street that block the snow clearing. According to a tally from the Frisco Police Department, 25 vehicles have already been towed this year, compared with 19 for all of 2016 and a total of 30 the year before. “Main Street has always been a problem with people leaving their cars,” said streets foreman Brad Thompson. Plowing from sidewalks pushes snow into the curb lines of the street, he explained, and trucks need to be able to come through and clear it out. Thompson said that while Frisco’s crews have been logging plenty of overtime, it’s difficult to gauge how much extra money a big storm costs because expenses are spread out across different budget items. In past years, he said, the need to occasionally bring in outside contractors for snow hauling has driven up costs, but that hasn’t happened yet. Silverthorne public works director Bill Linfield estimates that snow removal takes up around half of his department’s $2.6 million budget. In the 30-plus years he’s been with the town, he said, cost over-runs have never been an issue. A big priority during this warm interlude, Linfield said, is to clear snow from drainages and inlets. That allows snowmelt to run off rather than accumulate in the roads, where it refreezes. There’s also the question of where to haul all of the extra snow as open spaces near capacity. That can mean leaving snow piles in parking lots a little bit longer — and getting creative with storage space. The county, for instance, just got special approval from state regulators to dump snow at the Summit County Resource Allocation Park (SCRAP) should the need arise.